When the owner of a financial-services firm in Connecticut saw the U.S. tax overhaul pass in December, capping state and local deductions, he packed his bags. Now he lives in South Florida, soaking up the sun and some serious annual savings. Like many of Jay Phillip Parker’s clients these days, the empty-nester is a refugee of the Trump tax act -- and he’s closing soon on a $6 million Miami-area condo. 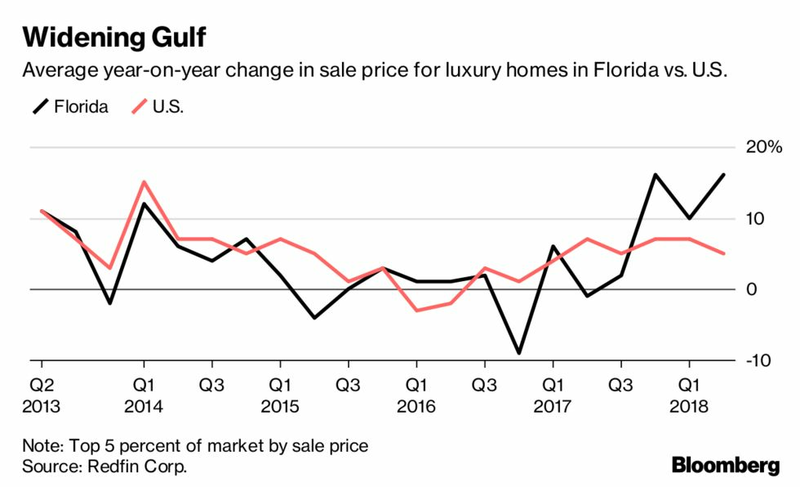 Luxury-home prices in Florida have been surging ever since the law went into effect, jumping 16% in the second quarter from a year earlier, according to data from brokerage Redfin Corp.
“The trigger is tax reform,” said Parker, chief executive officer of Douglas Elliman Real Estate’s operations in Florida, who declined to identify his Connecticut client. Aside from another 16% jump in the fourth quarter, prices for the top 5% of properties in the state rose at the fastest pace in five years, even as values in the rest of the Florida market rose only 7%, the slowest rate since 2015, according to Redfin. Luxury prices have moderated nationally, up 5% in the second quarter from a year earlier, compared with a year-on-year increase of 7 percent in the second period of 2017. Meanwhile, the new law’s $10,000 limit on the deduction of state and local taxes is hitting owners hard in the affluent suburbs of New York City, including Westchester County, New Jersey and Connecticut. The cap on deductions “changes the relative cost of living between high-cost and low-cost localities,” said Gus Faucher, chief economist of PNC Financial Services Group Inc.
Rich New Yorkers are also moving outside their Florida comfort zone, flocking to the state’s west coast, from Naples to Sarasota, favored traditionally by Midwesterners, Parker said. Sales of southwestern Florida’s million-dollar homes during the first half of 2018 were the highest in at least a decade, rising 25 percent from a year earlier, according to Florida Realtors data on existing properties dating back to 2008. Like sunshine in New York, it won’t last forever. Florida’s tax advantages will soon be baked into higher home prices, Faucher said. There may be other reasons for the sudden increase in demand for Florida’s luxury homes. Despite the deduction bite, the tax changes generally favor rich Americans, who may be using the savings to buy second homes, with Florida a familiar hunting ground. Plus, baby boomers, now in their mid-50s to early 70s, are in their prime downsizing years, said Brad O’Connor, chief economist of Florida Realtors.